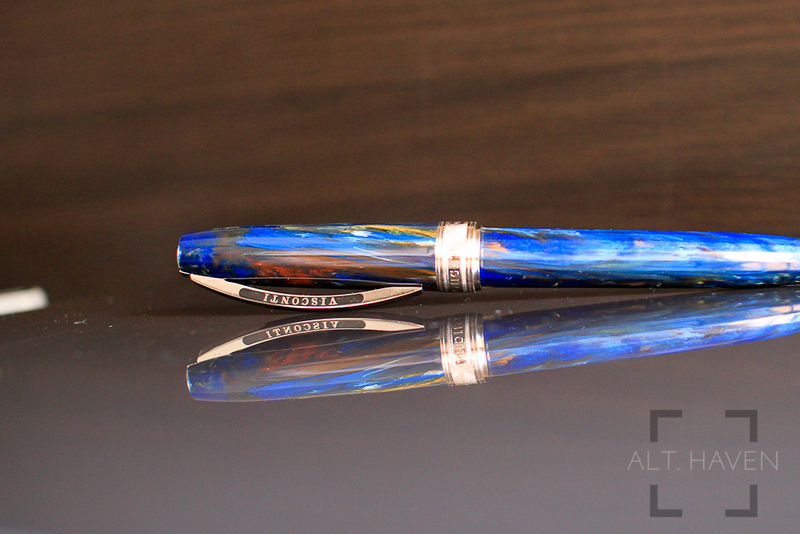 Visconti created a series of pens with resin mixes in homage to the colours of Van Gogh’s most celebrated paintings. There are 5 different designs in this series namely the Pollard Willows, Portrait Blue, Sun Flowers, Irises and Starry Night. 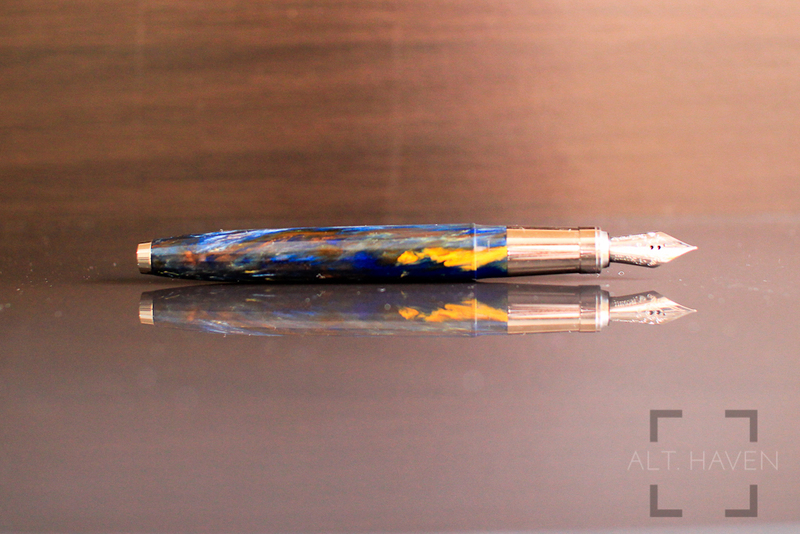 Each pen, even within its particular edition, is unique due to the mix of natural vegetal resin used to make the pen. 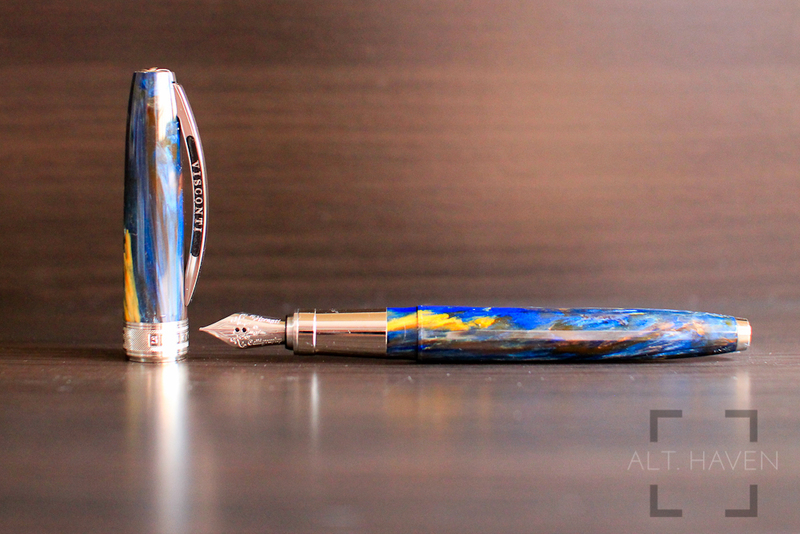 I purchased the Starry Night edition back in May when I travelled to Italy. 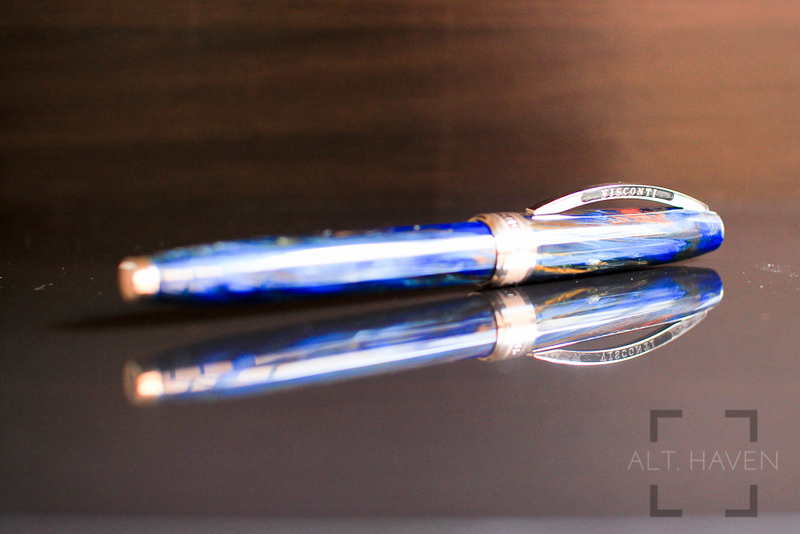 What better way to commemorate a trip to Italy than buying an Italian fountain pen? 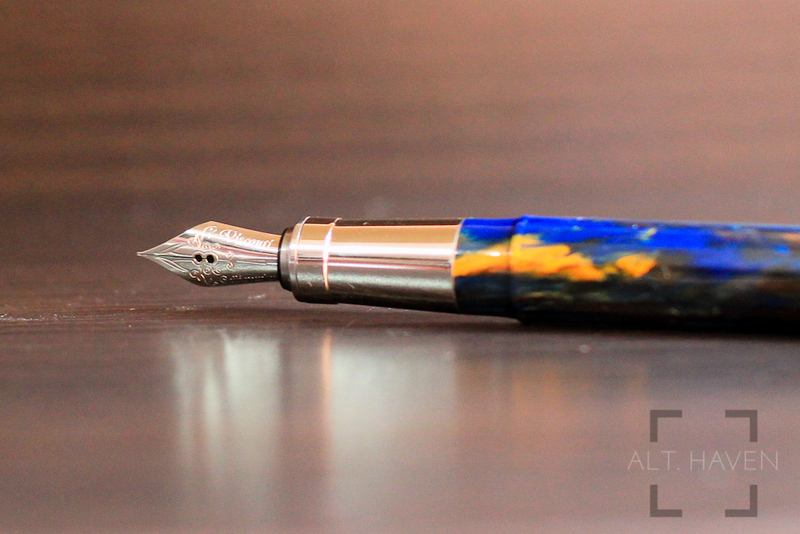 A warning, this is an extremely photogenic pen. I have not photographed any pen that I thought warranted this warning. I have not tweaked the photos in any way other than to white balance the pictures. The pen doesn’t look as good as in person it does in the photos. 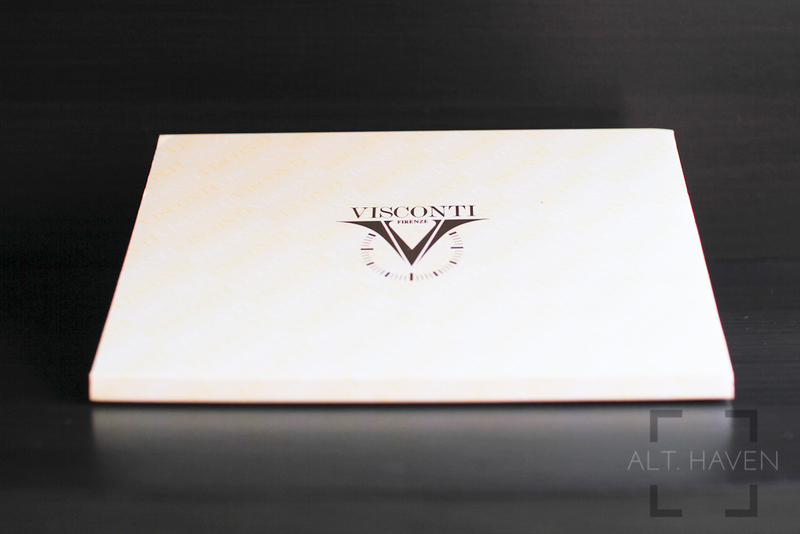 The Visconti Van Gogh Starry Night comes in a triangular cream outer card board sleeve which slides out to reveal a grey box underneath. The box feels nice to the touch and it is secured close with magnets. 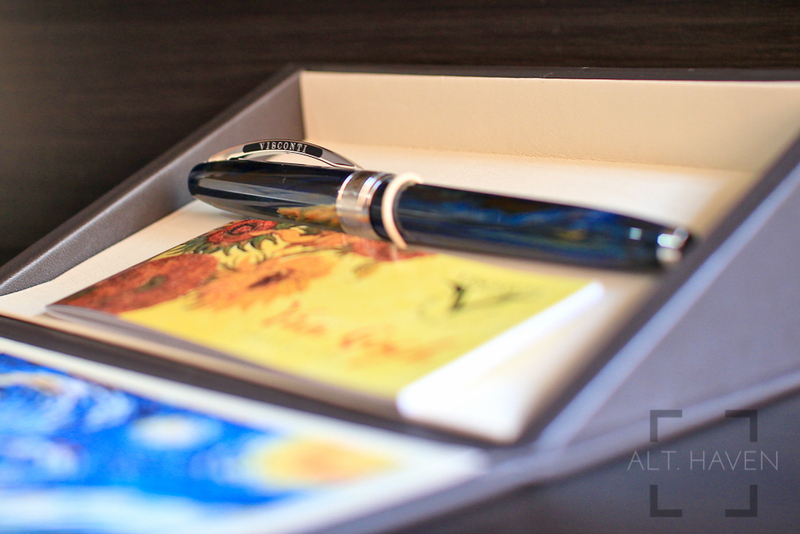 The box opens to reveal the pen along with a small booklet. At the bottom, the painting which inspired the pen is printed. The packaging is interesting and it showcase the pen very well but I would really prefer if the box isn’t an odd shape. It makes for difficult storage especially with other rectangular boxes. 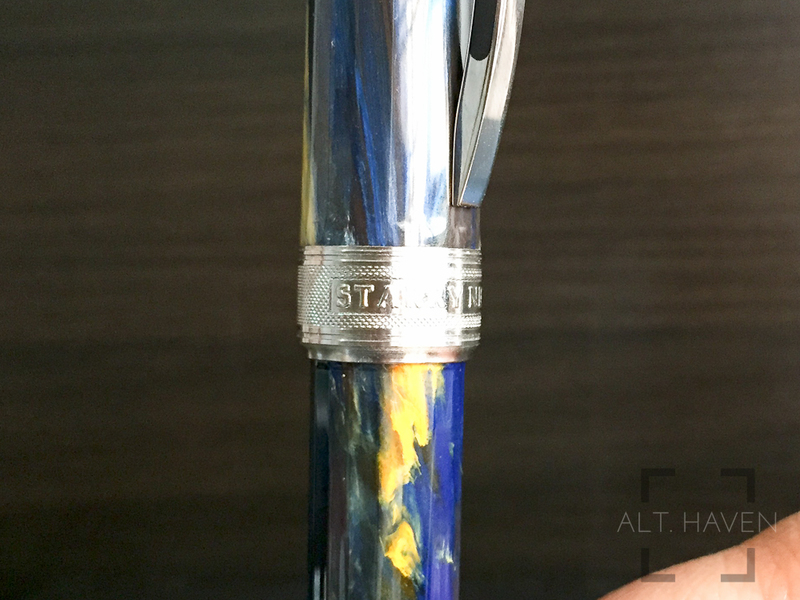 The Visconti Van Gogh Starry Night is a sleek, streamlined pen with the 18 faceted design, very much like the Visconti Michelangelo, that highlights the blend of colours. The pen tapers down slightly on both ends. It feels smooth to the touch and great in the hand. The blend of blues and yellow is accented with silver furniture. The colours truly makes me think of the starry night. 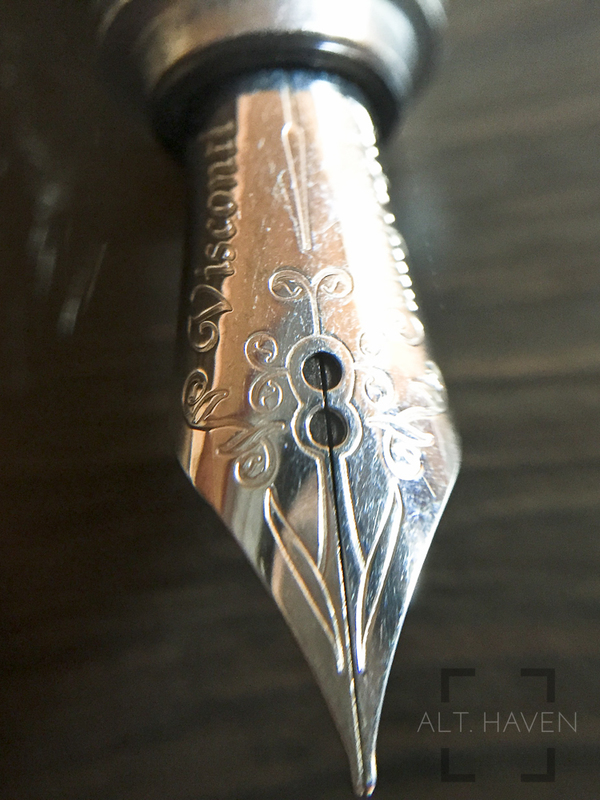 The pen has the Visconti logo on the finial of the cap. 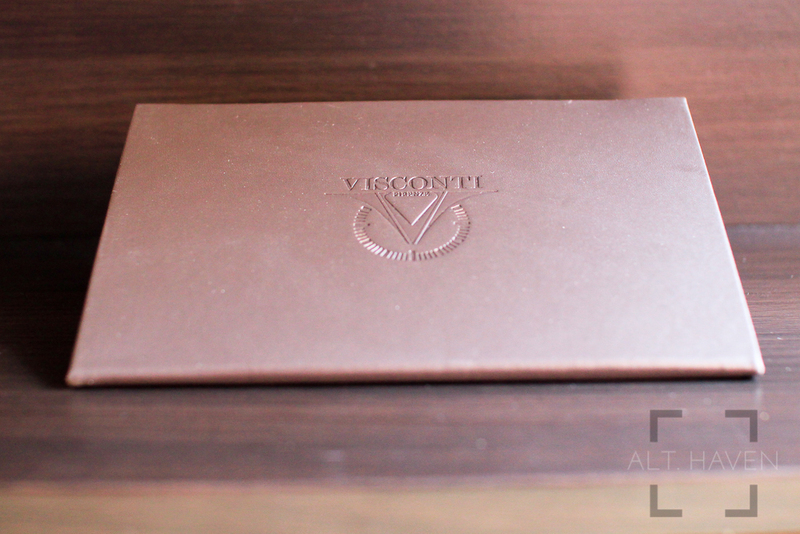 The Visconti logo cannot be replaced via the Visconti “My Pen System” because it isn’t compatible with this series. 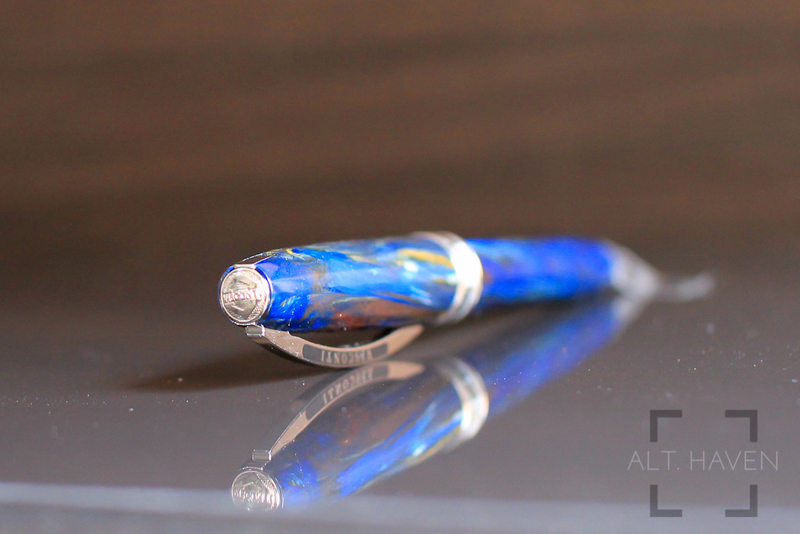 The pen has Visconti’s signature spring hinged clip. The clip isn’t very tight thanks to the spring hinge and it can be pulled up easily. It has a high arch which can accommodate thicker notebooks or jeans pocket. 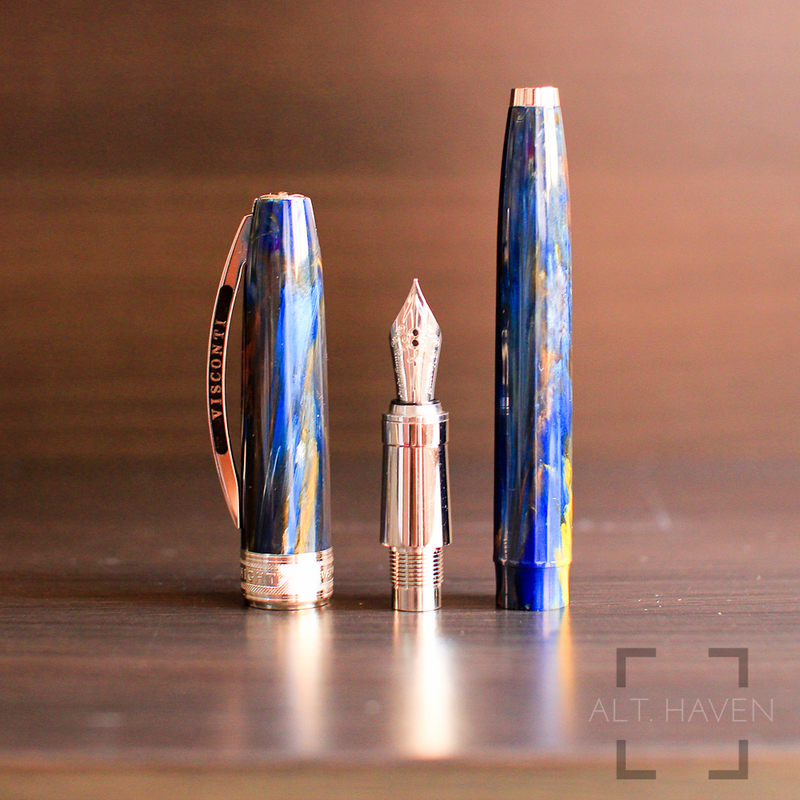 The Visconti Van Gogh has a magnetic cap likes the Rembrandt does. The magnetic cap secures the cap with just the right amount of resistance. It doesn’t come open with the slightest jostle and it snaps close with a satisfying click. The cap can be posted securely by pushing it into the end of the barrel. The silver centre band has the words “Starry Night Van Gogh” etched on it. The grip section is made of sleek metal. It is weighted to help balance an otherwise light fountain pen. However I found the metal section too sleek and slippery especially for longer writing sessions. I do not have sweaty palms but I’d imagine the slipperiness would be aggravated with wet palms. The step between the grip and the barrel is a small one and it isn’t so sharp that it bites my hand as I write with it. 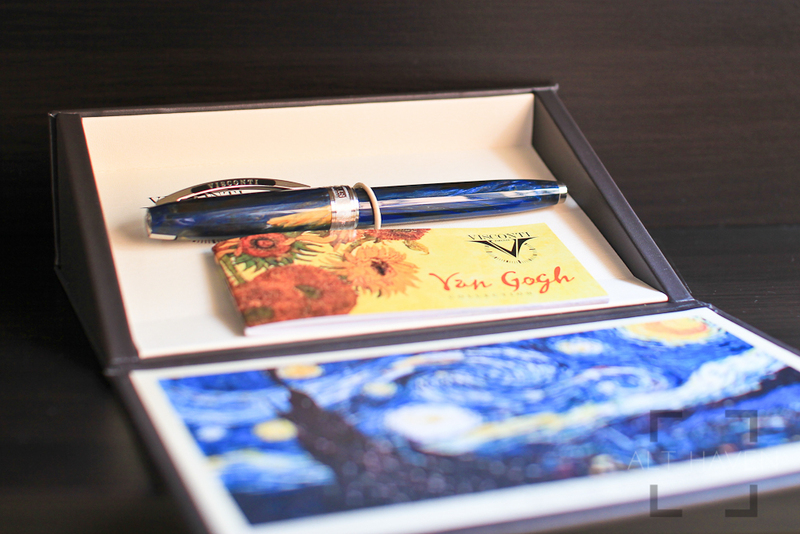 The Visconti Van Gogh is a cartridge and converter pen. 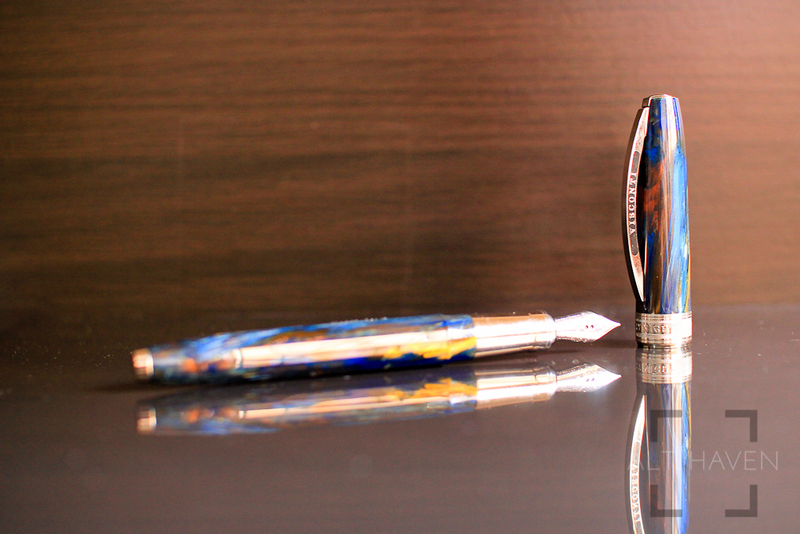 The pen takes a standard international cartridge or converter so I am not limited only to Visconti branded ones. There is a tiny flaw in the cosmetics of my pen. At the joint between the grip section and the barrel, there is a tiny part which doesn’t have any blend of blues and yellow on it. I can see the metal section that’s underneath the barrel. It might be a flaw but it is purely cosmetic and it doesn’t affect the functionality of the pen in any way. Though I had used it for more than a month before I saw it, I would prefer if I can unsee it. On the other end of the barrel is a very short section of metal. 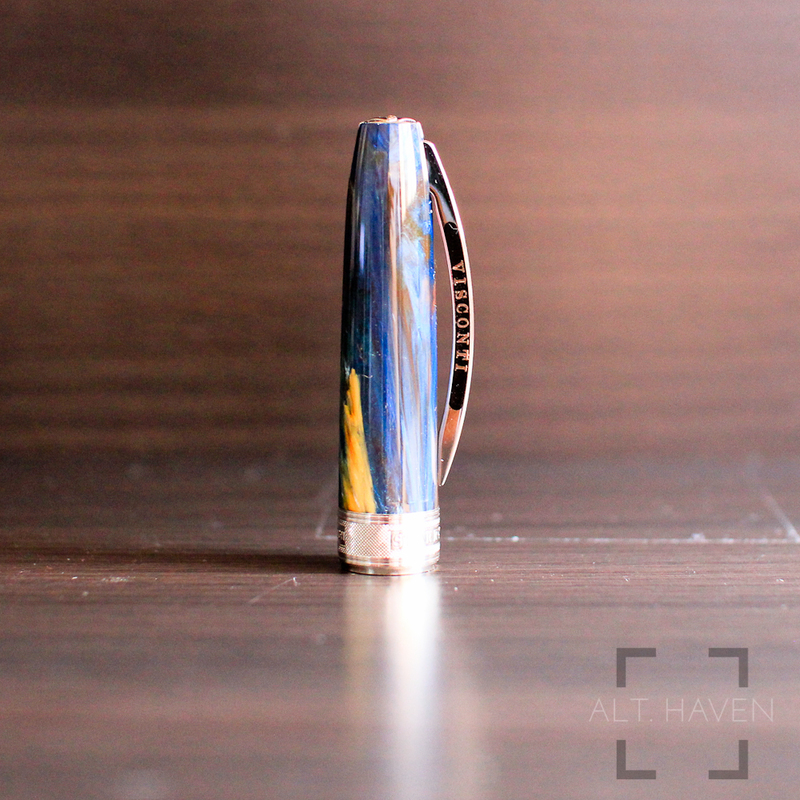 Capped, the pen has a nice weight in hand. Uncapped and unposted, the pen is slightly front weighted thanks to the metal grip section. Once the cap is posted, the pen is well balanced. I personally prefer to use my pens unposted and it is no different with this one. 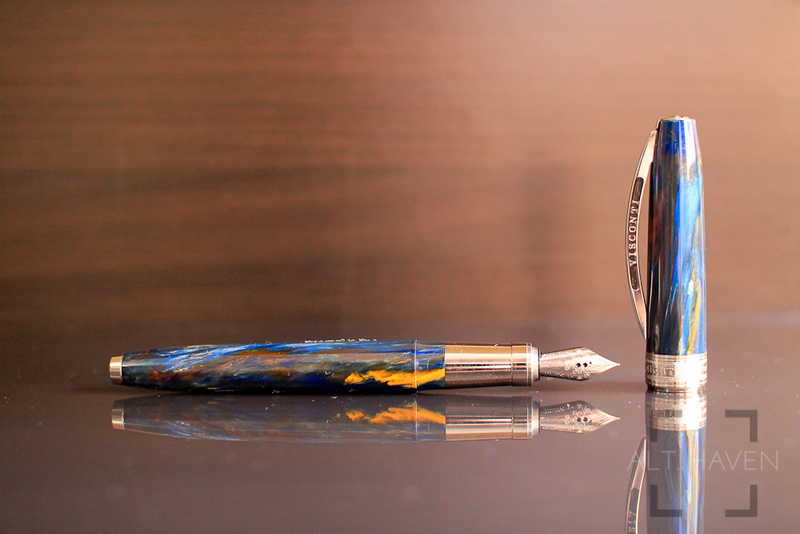 The Visconti Van Gogh comes with a stainless steel nib and I had opted for a EF nib. It comes with all the usual nib sizes from EP to B. However when I did a quick search online it seems that what’s available online goes from a F to a B. It turns out the EF nib is a new extra flex nib that comes in EF only. The stainless steel nib is slightly flexy but nothing I would compare with a Pilot FA or even a SF nib, after all this is still a stainless steel nib. Even without pushing it too much, the nib gives decent line variation and the feed doesn’t quite keep up with the flexing if I do it too fast. 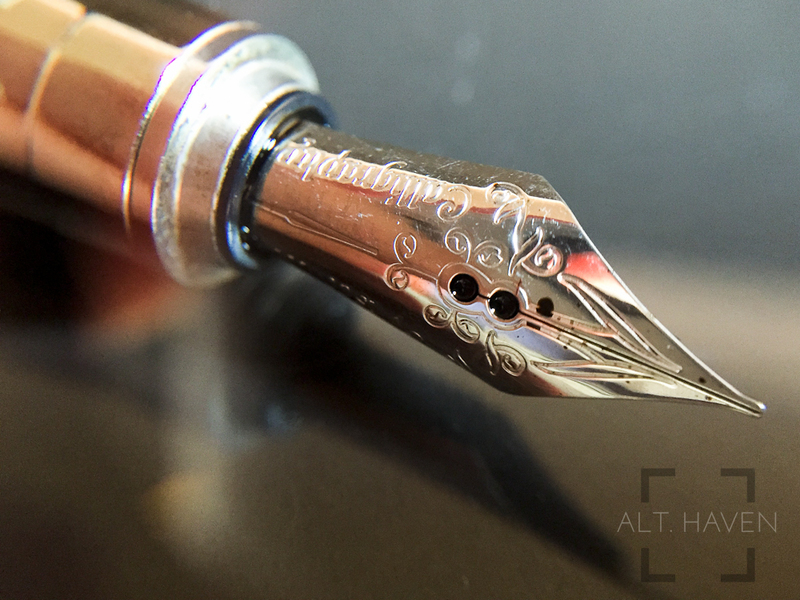 For regular writing, the nib writes smoothly with a slight hint of tooth but not overly wet. I was always under the impression that Visconti nibs are very wet but not so with my experience. This is most probably tempered by the EF nib. 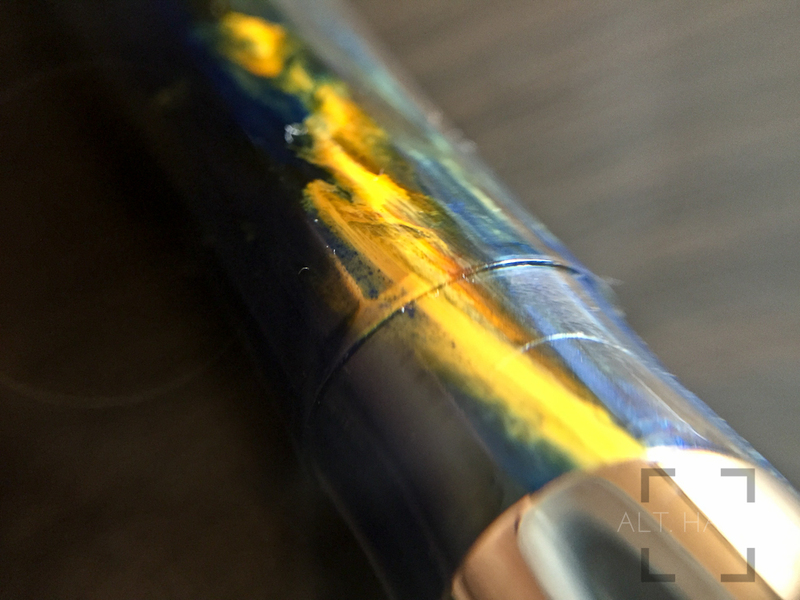 I’ve noticed that my nib comes with 2 circles as the breather holes but I have also seen pictures of the exact same model with a crescent moon shaped breather hole. I am not exactly sure why this is the case. If anyone knows, please let me know. Overall, I am very pleased with my purchase. 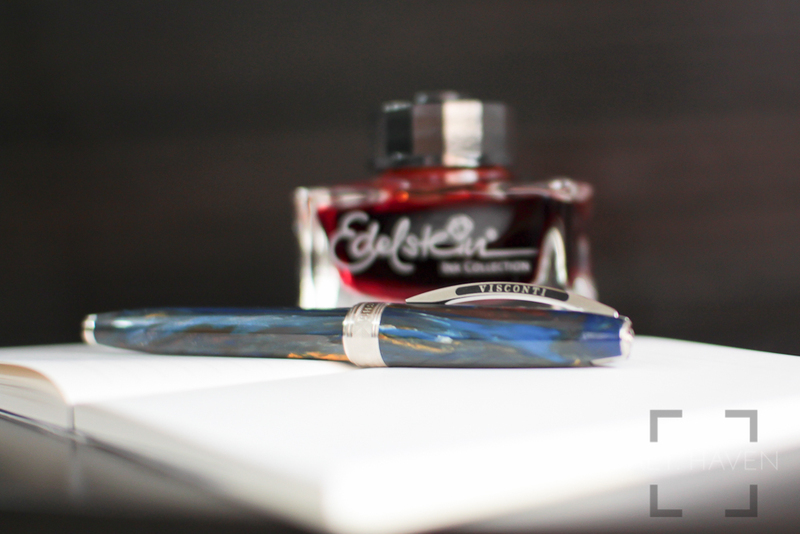 It was a happy accident that I got the new EF nib and my Visconti Van Gogh Starry Night is a particularly attractive blend of colours. This is the perfect pen to mark my trip to Italy.